If you are a normal Christ-follower, you have probably failed in the past. In fact, I guarantee that there was some crisis moment that called you to repentance. Whether it be something one would consider catastrophic to a simple recognition of the need to change. Whatever the case may be, there was once a time in which God woke you up from a spiritual slumber. The purpose of following Jesus,though, is not to make mean people nice, or even bad people good. It is to reveal to people that resurrection is possible, and in fact, needed. As a Christian, I mishandle the treasure of salvation daily, and there are times I forget that God’s power is available to me. I am in need of a resurrection. As I have observed Christians as a whole, I have noticed that I am definitely not the only one that struggles (as implied above). There are unhealthy behaviors that become natural temptations for the believer and I think they need to be addressed in all of our lives. I have named a few here but there are many more. Yes, they are sinful and need to be stopped. 1. Gossip– This virus…This rotten, hate-filled, ugly monster of a behavior easily rips through souls and congregations as if they are a paper bag. Think I am being a little harsh? I feel it is not harsh enough. Countless numbers of families, friendships, and churches have been split apart because of the seed that gossip plants. There is a difference between “hearing a prayer request” and gossip. Pray that God gives you the discernment (not the desire to justify) to make the distinction. AND, before pointing fingers, evaluate your own heart. So what if Sandy Smith (made up name) was seen at a rated R movie…have you been in God’s word consistently lately? Take this as a caution not an accusation. 2. Duplicity– One of the hardest things to convince a nonbeliever is that this Christian life is relevant outside of the walls of the church. It absolutely is, but how much of a testimony are we displaying if we abandon our beliefs when we leave the worship service and pick them up again next Sunday? It just doesn’t make sense. The spirit of God is available to us 24/7. He desires to make us whole at home as well. Don’t be a different person in private…stay consistent. 3. Unforgiveness– The Christ-centered life revolves around forgiveness. It is the most unique doctrine in the world. The fact that the Creator of the universe, knowing that we messed up everything, has forgiven us… THAT is powerful. Why, then, do we think we are more powerful? I mean, why do we think we can withhold forgiveness to ourselves or others? Think about that… A precious gift that is given to be distributed. Amazing. 4. Arrogance– Christians should look at themselves as the servants to the world, not the rulers of all in it. This is how we operate. So, to think that our belief system somehow makes us superior to anyone is absurd. Sure, we have an excellent eternity to look forward to, but we are called to serve…not to be served. Yes, we are God’s children so there is a royal implication, but this kingdom is much different that what we are used to reading about. It is a kingdom of willing sacrifice, worship, and surrender. 5. Ignoring Conviction– If you get tired of defending your actions (even when no one is condemning them) you may be under conviction about something. This is okay. It is natural. It is simply God telling you to do something else. Aren’t you glad that we serve a God that cares enough to convict you? Give up your need to be right all the time, and defend your habits, or life patterns. Truly listen to what God has to say. Then, make the changes necessary. You will find joy in it. 6. Discontentment– There is a gray area here that I will openly admit. On one hand, it could be that God is calling you to something bigger. On the other hand, it could be that God is calling you to bloom where you are planted. In any case, though, it seems like we often get into the destructive habit of constantly being unhappy with God’s provision or His call. We want more, and bigger, and better, and rarely praise Him when things are rough or seemingly sparse. Why? He created the universe with His voice. Why can’t He create more out of our little? Sure, we can tell Him we will give more if we have more, but should He really give us more if we are not extravagantly generous with what we currently have? Will He not provide? Be content each step of the way, and pray that you recognize when He is calling you forward. 7. Apathy– I encounter Christians, regularly, who just don’t care anymore. Perhaps they are in a spiritual slump or have unplugged from God for a while for some reason. They would not consider themselves and unbeliever, but there is definitely a hallow feeling…a “blah” feeling in their spirit. In these cases, I think God wants us to pursue Him harder than ever. Get back to the fundamentals. Reading scripture, prayer, and community worship are a great start. You will break through this… Keep reminding yourself that God’s grace does not run out just because you are tired. His power is still fully charged and ready to engage the enemy. 8. Worry– Christians call it “concern”. Stop it. He’s got this. Do I really need to remind you of the thousands of times God has come through? Do I need to remind you of the times God’s people helped you through hard times? Do I need to remind you about the times where God revealed a little personal message to you through His word? Nah…of course I don’t. You remember. If you haven’t heard this lately, let me be the one to say it…everything is going to be fine. Bigger things have happened and greater miracles are right around the corner. I hope, as you read these, you realize that I am in the same boat. Let’s all get on an exciting new journey where we reject the things that look nothing like Jesus. It’s okay to change direction as long as it is facing toward the Father. 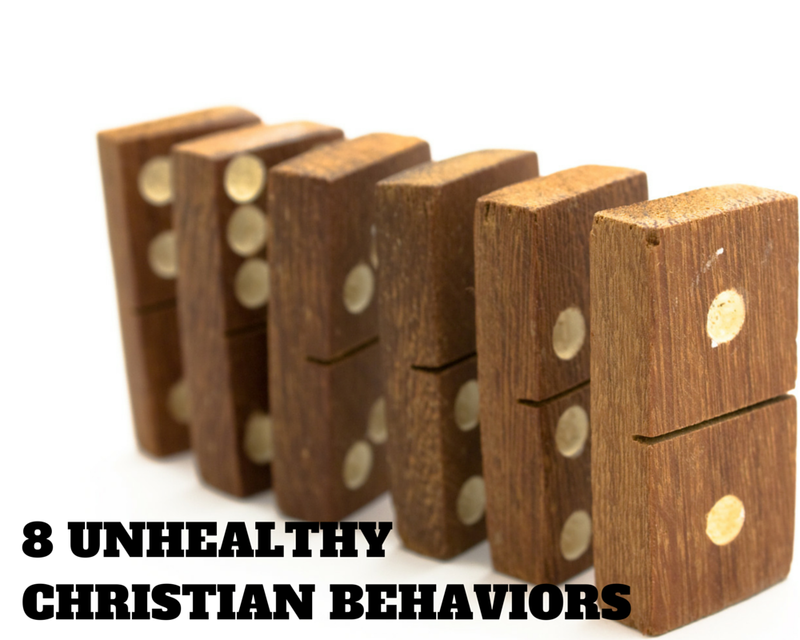 Unaddressed unhealthy behaviors can lead to a domino affect that will create a bitterness in your heart for what God considers good. Reflect. Recalibrate. Return to His design. Great job saying what needs to be said to all of us ….no matter how long we have been Christians. So proud to call you my Pastor!